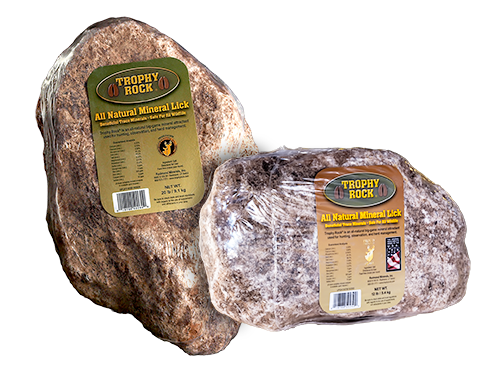 Trophy Rock is the #1 selling deer supplement in the industry and we’ve got it right here at Farmers Coop. Trophy Rock is the most effective all-natural mineral supplement available and serious hunters swear to us they’ve never used a better product. With 65 natural macro and micro trace minerals, this product improves antler growth and over-all herd health. It also attracts and holds deer on your hunting property. It is a fantastic scouting tool when used in combination with trail cameras. Placement It’s important to choose a secluded area for your Trophy Rock sites so deer don’t feel nervous. If the deer aren’t comfortable near your sites they may visit irregularly or only at night. Site Set-up We recommend placing Trophy Rock on a stump or another flat rock keeping it up off the ground. It will last much longer in the field if you avoid mud puddles. We have also found deer to be much more relaxed at mineral sites when the product is elevated so they can lick on in less of a defensive posture. Deer will find your Trophy Rock the first time they walk downwind from your site, so it’s a good idea to place it near a well used trail or at an intersection. Trail Cameras Trophy Rock is the perfect companion for trail cameras. Choose a high-quality camera with a large memory card so you won’t have to disturb the site often to retrieve your pictures. Position your camera to the north or south of your lick, otherwise the sun will ruin many of your pictures. July and August is a great times to do a trail camera inventory of your herd. Rock Replacement You should replace Trophy Rock when it is about the size of your fist. Deer will keep coming back even after the rock is gone but they get more benefit when they can lick directly on it instead of scraping the ground for minerals that have leeched into the surrounding soil. Pick up Trophy Rock and all your hunting attractants and feeds at your local Farmers Coop. This entry was posted on Thursday, August 25th, 2016 at 8:27 pm	and is filed under News & Updates, Wildlife, Deer. You can follow any responses to this entry through the RSS 2.0 feed. Both comments and pings are currently closed.